The state of Michigan is synonymous with the automotive industry. For hundreds of years, Michigan has been known as the hub of auto manufacturing. While auto manufacturing is still one of the largest industries in Michigan, the state is also a top producers of agricultural commodities, a growing hub for information and an important leader in healthcare. Michigan is home to the busiest border crossing in North America and one of the largest air hubs to Asia, providing jobs in the food science, transportation and business administration sectors. The following page details the fastest growing vocational and trade careers in Michigan and educational options for students. In Michigan, students get to choose from numerous trade and vocational institutions throughout the state. The most popular field for students attending a community college or other trade school is healthcare, a fast-growing sector in Michigan and surrounding states. 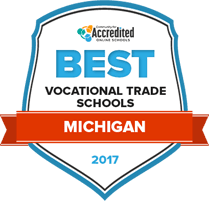 Our rankings of Michigan trade schools are based on a variety of factors, including financial aid and tuition. All schools listed here offer placement services to grads. The vocational degree programs at Delta College offer students the opportunity to earn associates degrees in a supportive and innovative learning environment. The school is a charter member of the National League for Innovation in the Community College. This organization, which brings together 20 college districts, allows Delta to incorporate innovations in learning practices that have proven to be effective, with improvements to instruction and college services that benefit its students. The school is also committed to sustainability, not only through efforts towards reduced emissions from the campus, but also through the availability of over 30 sustainability-related courses. Students pursuing a vocational degree at Mott Community College will earn an associate of applied science in a career-specific field related to industry, health, technology, business, or human services. Graduates will be prepared to enter the workforce upon completion of the program; many choose to continue their education while working at the same time. Prospective students can learn about potential career tracks relevant for each program on the school’s website, with job possibilities and career projections on each degree page. Many programs, such as the dental assisting track, prepare students to take licensure exams upon graduation. Kirtland Community College’s two-year degree programs prepare students for careers in the health sciences, trades, business, technology, and public safety. Students benefit from the small class sizes and frequent communication with faculty that the school emphasizes, and courses include hands-on elements that translate to valuable skills in the working world. Both students and graduates have access to the school’s employment resources to find a job after graduation. They include a resume workshop, portfolio development assistance, interviewing and employability skills guidance, and assistance in job searches. Transfer students are welcome, and those who earned credits from any school in Michigan can access detailed transfer equivalency information through the Michigan Transfer Network website. Wayne County Community College District is comprised of five college campuses and a university center throughout the region. With locations in industrial, metropolitan, and rural areas, students have access to businesses, organizations, and trades where they can gain experience related to their field of study. The school emphasizes occupational and career programs, but university transfer programs are available as well. Students can use the Learning Resource Centers at each of WCCCD’s campuses or through online access. Working students who may need additional flexibility can choose to attend “Weekend College,” which offers courses on Friday evenings as well as Saturday mornings and afternoons. Along with its associate of arts and associate of science programs, Washtenaw Community College also gives its students the option to study in a vocational associate of applied science program. These programs provide a more targeted, field-specific curriculum to quickly prepare students for a career in the field they want to pursue. These programs offer the benefit of allowing students to participate in an assortment of applied educational opportunities. Many Washtenaw Community College classes can also be taken in an online format, giving students the chance to complete more credits where they might not have been able to in a traditional class setting. Alpena Community College gives students a supportive entry into higher education, with small class sizes, frequent communication with instructors and peers, and two local campuses. Vocational programs at the school are career-focused, preparing students to enter the workforce. Some programs also allow students to transfer to four-year programs if desired. Areas of study range widely, with technical programs such as automotive service and repair, healthcare programs such as nursing, and business programs in medical coding and office information technology. Beyond classes, services available on campus include a library, a volunteer center, a student services center, and wireless access in several campus locations. Michigan offers vocational and trade programs at the high school, community college and four-year university level covering ranging industries from healthcare to business administration. Search now to find a program and school near you. Outside of the automotive industry, Michigan boasts several growing industries such as the biotechnology, information technology, and healthcare fields. There are six public high schools in Michigan offering primarily vocational and trade school programs. According to the U.S. Department of Education, 227,145 vocational students were enrolled during the 2013-2014 academic year. 95 percent of high school students who enrolled in vocational and trade program in 2012-2013 graduated. 95 percent of graduates went on to post-secondary education, the military or entered the workforce. Students can earn vocational and trade degrees at schools across Michigan. Several public high schools offer career and technical education programs to students currently enrolled in high school. While nearly half of Michigan’s undergraduate credentials are earned at the bachelor’s degree level, associate degrees and certificates are also popular options in the state. Michigan’s economic history is closely tied to the automotive industry. In many ways, the past is driving the state’s future as businesses focus on technology and advanced manufacturing. With continued company growth in the automotive industry, vocational and trade students can easily find jobs in the automotive field after earning related vocational degrees and certificates. The state’s largest employer is the University of Michigan at Ann Arbor, with several companies in the healthcare industry rounding out the list of top employers. Seven of the top 10 largest employers in the state are hospitals or health systems, leading to job opportunities for graduates of nursing, medical assisting, and other healthcare assistant programs. The following chart illustrates career options for vocational and trade graduates with the most job openings in the state. Manufacturing and automobile industries may have seen a setback in Detroit in recent years, but the city is currently working hard to rebuild. Currently, Detroit’s economy is supported by automobile manufacturing and the construction industry, with over 7,000 new construction jobs added in both 2013 and 2014. Since 2014, several large biotechnology and information technology firms have moved to the Detroit area, creating job availability for industrial engineering technicians, computer user support workers, and IT specialists. Opportunities to earn vocational or trade certificates and degrees are available at several accredited institutions in Detroit. Wayne County Community College District is a large public college offering students certificates and degrees in mechanics, health professions and computer and information sciences. Dorsey Business Schools - Dearborn, Everest Institute – Detroit, Focus-Hope Information Technologies Center and Marygrove College offer programs in construction, health professions, education, computer science and social work. Information about vocational and trade programs in Michigan at the secondary and post-secondary level. An overview of CTE programs in Michigan. Information for students, parents, and educators about Michigan's career and technical education standards in each career industry. Provides a list of adult education opportunities and community college services. Job search database for all Michigan residents. Includes resources to explore careers based on skills and training, as well as special resources for skilled trades jobs. Serving Wayne County, students and parents can find information about vocational and trade program curriculum, financial aid and direct information on earning a trade degree in Wayne County.